You may use Memorial Haven as a means to notify people of a death including details of funeral and memorial services. Insert prayer services and funeral arrangements (date, time, place). 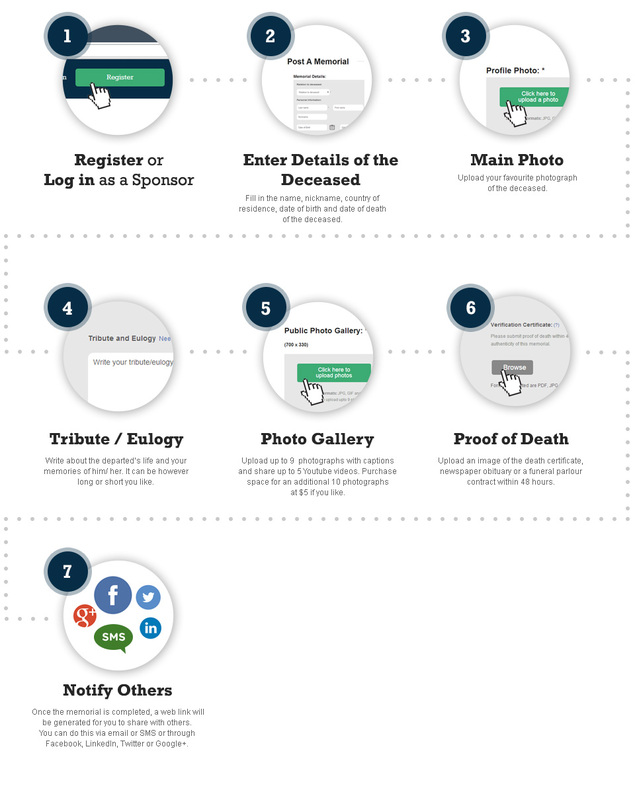 As the sponsor of the memorial, only you can edit, add or remove content from the memorial page as many times as you would like. You are also allowed to nominate a maximum of five persons as secondary sponsors with editing rights. Memorial Haven reserves the right to remove any content (written or photographic) that is not in good taste. If there are condolence messages that a sponsor finds objectionable and would like to have removed, Memorial Haven will do so accordingly. We will suspend the condolence and investigate the matter further. We reserve the right to bar those who intend mischief or further grief to the bereaved. Some aspects of the person’s memorial you may wish to make accessible to selected people, usually immediate family members or close friends. The Private Gallery is for this purpose. As the sponsor of the memorial, only you and your nominees can access the private gallery. You must provide the nominees’ emails and create a password for their access to the private gallery. A one-time fee of US$25 is charged for setting-up a private gallery. To avoid false memorials with intentions of mischief, Memorial Haven requests that the owner of a memorial provide documentary evidence such as a death certificate, a newspaper obituary or article or a contract from a funeral home. Proof of death should be submitted within 48 hours of a memorial’s posting, failing which, the respective memorial would be removed.